Rainbow Sugarcraft: S'now Joke Delivering Wedding Cakes in Scotland! 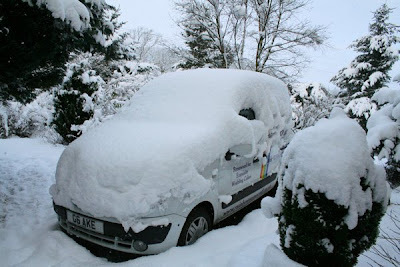 S'now Joke Delivering Wedding Cakes in Scotland! It's been a serious business delivering Wedding Cakes this last seven days and today it's snowing again, heavily! Thank Goodness the trusty Rainbow Mobiles have been up to the challenge and once they are dug out they have managed to deliver Wedding Cakes and Croquembouches to Glasgow, Edinburgh, the North of England, Dumfries, Gretna and even Aberdeen. It's very much the case of keeping an eye on the weather forecast and allowing plenty of time, some Wedding Cake deliveries taking twice as long as normal. So we are really pleased with our 'snow mobiles' but if things get really bad we also have two four by fours on call so even if the guests don't arrive the cake will!